Burn this subtle, sweet-scented South American wood to cleanse your space and calm your mind. You go to yoga to align your chakras, and the spa to pamper the day away. But how do you keep the positive vibes flowing once you get home? 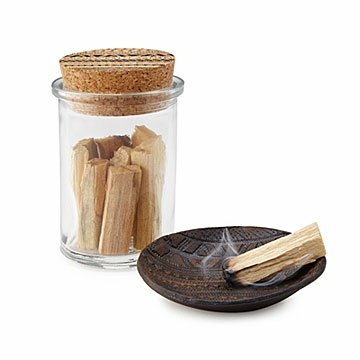 Try these palo santo sticks that have a subtle, sweet scent like citrus and mint. Light the end of the wood until it's burning like a match, place it in the fire-resistant ceramic tray, and allow the smoke to fill your space with a delightful, calming aroma. In South America, palo santo is believed to be "holy" and "sacred"—probably because it's so soothing (we tried it, and we're hooked). A thoughtful gift for mindful friends, it's an easy way to shift the energy in their space and remind them to breathe. Wood sourced from Ecuador. Dish handmade in Minnesota. 12, 2" sticks; Jar: 2.75" L x 4.5"H; Bowl: 3.75" dia. Lay burning sticks in the ceramic dish or on a fire resistant surface. When lit, do not leave the sticks unattended and keep them out of reach of children and pets. Perfect Gift For The Person Who Has Everything. Great birthday gift. The tray is beautiful. Needs an instruction card or some other literature descibing the product. Nothing was included. I love how simple yet thoughtful this gift is!